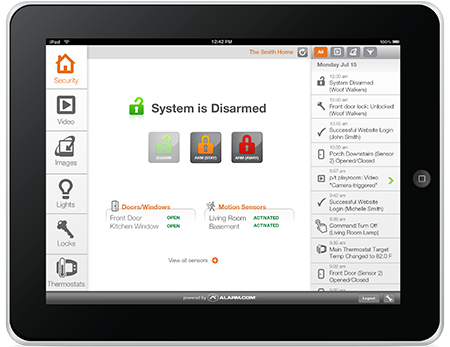 Combining smart home control with your security system keeps you, your family and your New Orleans or Baton Rouge, LA home safer and more secure. A smart system means you’ll always be in touch with your home—wherever you are in the world. You can stream video from security cameras to tablets or smartphones. With access control, you can keep track of when your kids get home from school or let in a worker performing service. You can deactivate or activate alarms from anywhere. When your security system is integrated with other smart technologies, you can utilize your lights, audio, and other features to help keep you safe. Your alarm system should only make life difficult for intruders. We create custom solutions that mesh perfectly with your lifestyle, so that you will gain peace of mind without any headaches. While you’re away, the alarm system will help keep you informed if something goes wrong. If you forget to close a door or window all the way, you can receive an email alert. Use your smart devices to monitor activities at home from wherever you are. When you’re home, easily set the alarm at the touch of a button right from a touchscreen or smart device. Security cameras in your Prairieville, LA home allow you to monitor all your spaces. If you’re at home, you can use the cameras to check in on your children playing in the backyard. If you’re away, you can stream live video to your phone. Let’s say you receive an alert from your security system, use your cameras to make sure everything is as it should be. The various camera types include pan-tilt-zoom, covert, long-range, and nanny cams. We will work with you and your needs to mix and match these camera types and capture every area of your home. Every home has smoke, heat, and gas detectors, but a smart home takes them one step further. Integrating these monitors into your security systems mean direct communication between you, the system, and emergency services. If a heat or smoke detector goes off while you’re way, you can expect a rapid response from the fire department and your HVAC system to shut off. Plus, you will receive communication from your system through your smart devices, so that you will be aware of every step. Your system can also be connected to health-related sensors like fall detectors to maximize your safety. Automated door locks not only add extra protection, but they also add a whole new level of convenience. No longer will you have to struggle to find your keys while holding groceries, pets or children, you can unlock the door from the car with your smartphone. Plus, you will never wonder if your children got home from school or not, your door can send you the message. You can also add automated locks on interior doors to protect sensitive areas like gun rooms or wine cellars. Alarm monitoring is all about keeping you in touch with your New Orleans home’s security system. Modern technology improved and expanded the monitoring world. Gone are the days when you needed a landline for premium monitoring service. While a landline is still a great option, you can now choose to employ a cellular radio to link your alarm system to a monitoring station. This versatility provides the homeowner with options, opportunities and, perhaps, questions. Home Protection Systems will be there to help provide answers and find the solution that syncs perfectly with you and your security system.